From the Cosmopolitan event I am wearing a top from fame femme. It's made for Maitreya and comes in 15 colors. The skirt is from ChicModa. It's made for Slink and Maitreya. With single purchases you get a HUD to change the belt, buckle and notch holes. All parts are changeable with the fatpack HUD. The fireplace can be won in the Autumn Table Gacha by Duvet Day. From the U L T R A event I am wearing hair from no.match. There are three female sizes and one male size included, plus hairbases in system layers, CatWa, Omega, LeLutka and TMP. The skin is from Mignonne. It's made for CatWa mesh heads. It includes two brow options, no brows and freckles. I am wearing the 'Porcelain' tone. A new round of Deco(c)rate is almost upon us. Sign up now! While you're doing that, check out last months crate. It includes amazing items like the bed from Serenity Style. It has single, cuddles and adult animations. It also comes with the side table, book, glass and plant. 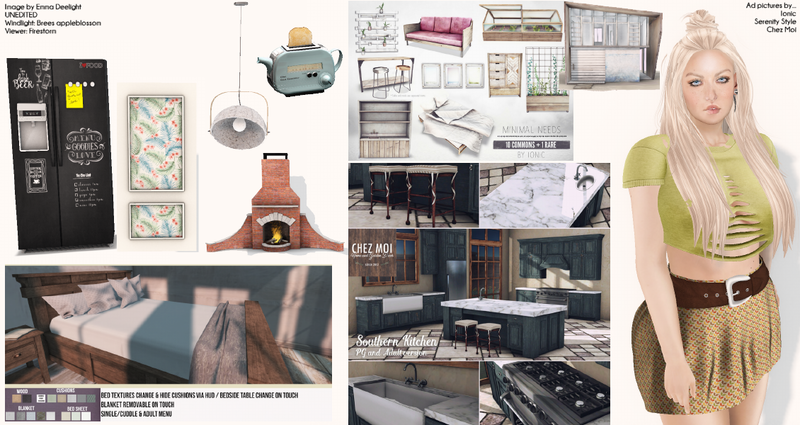 From Chez Moi, I have pictured the oven and sink modules from the Southern Kitchen set. There is also a island bench and chairs. Please note that is not the fridge that is part of the sink module. For more Deco(c)rate info, click here. I hope you enjoy today's studio look.